In this beautiful book, Dostoyevsky, Orthodox liturgy, and Holy Fathers ancient and modern converse with Shakespeare, Frost, Salinger, Jane Kenyon and René Girard, sharing insight into such realities as memory, violence, depression, stillness, self-emptying love, personhood, and the anthropology of the Cross. This conversation, a spiritual ecumenism effected in art, gathers finally round the heart and source of all tradition of poetry and prayer in Christian East and West alike: the Psalms of David. Orthodox Christian contributions to Anglophone poetry and poetics are few. 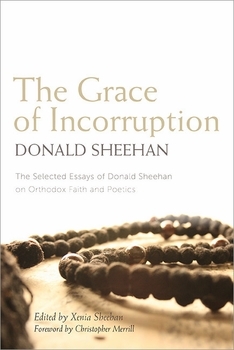 Don Sheehan was not only a fine interpreter of poetry, but a poet himself, working in the medium of prose. The philosopher Malebranche famously wrote that attentiveness is the natural prayer of the soul, and the Orthodox liturgy bids us continually to be attentive. The essays in this volume capture that spirit of loving attentiveness -- never lacking in form -- for which Don ardently strove, and which characterized his approach to art, to other people, and to God.Fr. Matthew Baker, Fordham University"